I am not sure if I totally agree though. I am a very introspective person and I am quite self-aware. 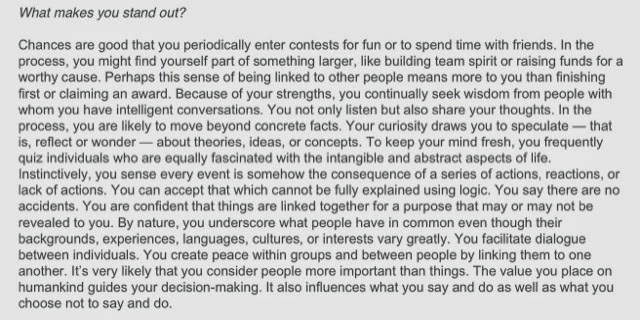 So I am surprised at Connectedness and Input. I am definitely a Intellection or Thinking person and a Learner as well, and I agree on Empathy. 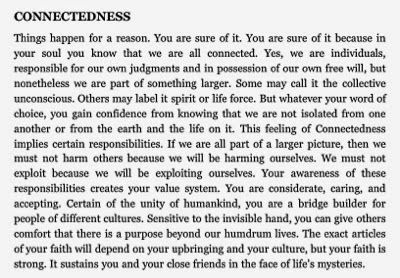 Reading on what Connectedness is, it doesn't quite strike it with me. Connectedness people are those who "have faith in the links between all things. They believe there are few coincidences and that almost every event has a reason." No, it does not do anything for me. This is better, though I don't enter contests for fun but I do spend time with friends. 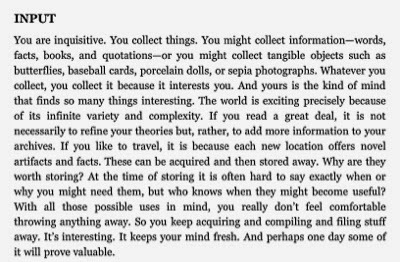 This sounds like my Intuitive function, based on Jung's personality theory, but I am not sure if I really believe so strongly that "things are linked together for a purpose that may or may not be revealed to me". I am not sure, and what more, it is my number one strength. Do I not know myself? What I will do now is to think and contemplate on it. Maybe this is one part of me that I have not yet discover. I shall see. Alright, even though the book's description does not do much for me, the report does resonate with me. It's just that I never thought of this as my strength. I collect books, printed and electronic. I collect articles that interest me, I've hundreds now in my Pocket app. I intermittently collect quotations. I used to collect recipe books, and box-files and box-files of loose recipes. I collect movies and serials. I collect iPhone/iPad apps. I collect music scores. I collect notebooks, empty and still brand new, because I just love them. I used to collect mugs until I ran out of space. Oh, no...I am bordering on being a hoarder! Okay, okay...I am an Input person. The trick now is to build on it and make something good out of it. This is so me. Can I have this one instead? I am looking forward to reading what you learned about it. 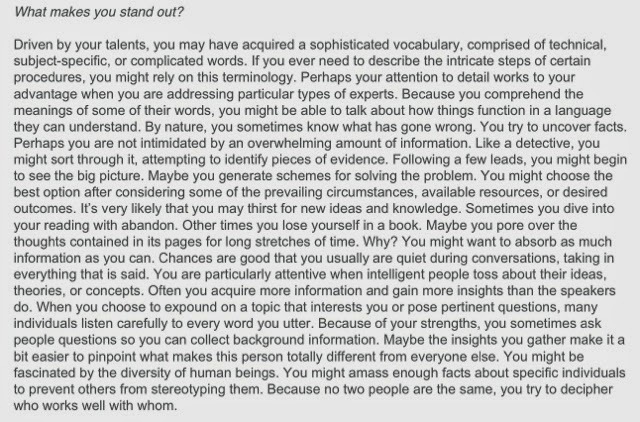 Wow...it is amazing to know that your strengths have not changed even after 4-5 years. The other of your strengths are high in my list too. Adaptability is my #6 and Maximizer #7. How do you see yourself from the dynamics of your 5 strengths? I find that they are manifested quite differently in different people. I met a lady in the same training event who has the same 5 as I do, but in different sequence, and I find that we are alike but yet not at all alike, which is amazing. Share with me what you do with your report of the top 5.